Under "Calendars," click "Add a calendar"
Choose a color and permissions and click the "Add calendar" button. If you want other Google Calendars on your Backpack Calendar, just repeat the process for each. Is your mobile phone service supported by Backpack SMS reminders? 1. Backpack > click "My info" on the top right of the page. 2. Under "Mobile phone reminders" click on the "Select a service..." pulldown menu (shown on right). 3. If your mobile phone service is listed, you should be all set! If not, let us know by submitting an official support request. Comes in handy if you've got a lot of Calendars or just aren't sure which events go with which person/category/etc. Backpack can send reminders to you via email or as a Mobile SMS/text message. 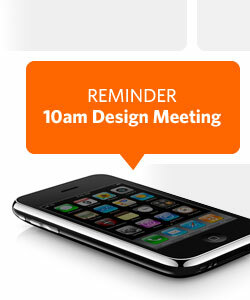 That means you won’t ever forget to attend a meeting, make a call, or any other task that you have to do. You can even set and schedule reminders for your co-workers too. You can schedule reminders for you or your team by clicking on the Reminders tab in your Backpack account. 1. Give the reminder a name. 2. Choose a time for the reminder. 3. Select the people to notify. Backpack will automatically send an email message or mobile text message to the people that you selected on the time and date you have chosen.